Arcosteel manufactures high quality steel in the form of rolled round bars, cast billets, wire rod coils, rolled semi billets, various heat treatment facilities, as well as any other product derived from them, abiding to international specifications. Every product is customizable to our customers’ requirements and available for local and foreign markets. Quality is what really sets us apart. 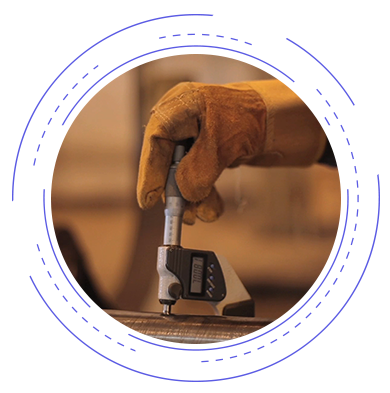 Every employee at Arcosteel truly understands our management system as a whole and our goals. So in turn each employee undertakes his job at the highest standard, which also helps the company’s growth through practical innovation. To reach a production level of 200 thousand tons every year, by completing our new productions units for both steel rolling and finishing. Encourage other productions based on special steel. To grow and become the center of manufacturing special steel in all of the Middle East and Africa, through constant research and innovation. Complete the new expansions for the factory and build the Electric Arc Furnace number 2, as well as the remaining steel units and performing the necessary renovations. Continuous study of the local and foreign markets, to start introducing our products into new markets and satisfying the needs of our customers. In addition to increasing the production of economic alloys. Prioritizing new research and innovative methods through research centers and Egyptian universities. •	To make our factories more environmentally friendly and decrease their emissions. As well as using our research to decrease emissions in the Middle East and Africa. Decrease consumption of natural resources. Making our responsibility towards our nation and the environment a higher priority.